Victorious doughboy holds German helmet amidst the ruins of Catigny. The Kaiser walks with war and hunger. "Neutral America and the hun." 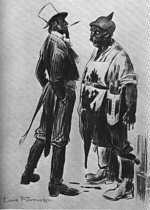 Uncle Sam with his hands in his pockets confronts the hun butcher. Germany checkmates Russia. On the left: Grand Duke Nicholas (seated), Cadorna, French and Joffre. 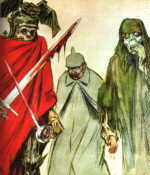 On the right: Hindenburg (seated) and Hotzendorff. The other side of the coin: a Russian soldier whips the Kaiser while stepping on a miniature fleeing Franz Josef. Propaganda at its best. 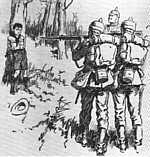 A French boyscout is executed by German soldiers. I'm sure this activity was high on their priority list.